← Does Jesus = Salvation? He was talking that day about how and when he observed Sabbath. What was he saying when he made this odd statement? 8 ‏ד‎ 8 “Remember the day, Shabbat, to set it apart for God. 10 but the seventh day is a Shabbat for Adonai your God. and not the foreigner staying with you inside the gates to your property. This is why Adonai blessed the day, Shabbat, and separated it for himself. 1 They traveled on from Eilim, and the whole community of the people of Isra’el arrived at the Seen Desert, between Eilim and Sinai, on the fifteenth day of the second month after leaving the land of Egypt. 2 There in the desert the whole community of the people of Isra’el grumbled against Moshe and Aharon. 3 The people of Isra’el said to them, “We wish Adonai had used his own hand to kill us off in Egypt! There we used to sit around the pots with the meat boiling, and we had as much food as we wanted. But you have taken us out into this desert to let this whole assembly starve to death!” 4 Adonai said to Moshe, “Here, I will cause bread to rain down from heaven for you. The people are to go out and gather a day’s ration every day. By this I will test whether they will observe my Torah or not. 5 On the sixth day, when they prepare what they have brought in, it will turn out to be twice as much as they gather on the other days.” 6 Moshe and Aharon said to all the people of Isra’el, “This evening, you will realize that it has been Adonai who brought you out of Egypt; 7 and in the morning, you will see Adonai’s glory. For he has listened to your grumblings against Adonai — what are we that you should grumble against us?” 8 Moshe added, “What I have said will happen when Adonai gives you meat to eat this evening and your fill of bread tomorrow morning. Adonai has listened to your complaints and grumblings against him — what are we? Your grumblings are not against us but against Adonai.” 9 Moshe said to Aharon, “Say to the whole community of Isra’el, ‘Come close, into the presence of Adonai, for he has heard your grumblings.’” 10 As Aharon spoke to the whole community of the people of Isra’el, they looked toward the desert; and there before them the glory of Adonai appeared in the cloud; 11 (A: vi, S: v) and Adonai said to Moshe, 12 “I have heard the grumblings of the people of Isra’el. Say to them: ‘At dusk you will be eating meat, and in the morning you will have your fill of bread. Then you will realize that I am Adonai your God.’” 13 That evening, quails came up and covered the camp; while in the morning there was a layer of dew all around the camp. 14 When the dew had evaporated, there on the surface of the desert was a fine flaky substance, as fine as frost on the ground. 15 When the people of Isra’el saw it, they asked each other, “Man hu? [What is it? ]” because they didn’t know what it was. Moshe answered them, “It is the bread which Adonai has given you to eat. 16 Here is what Adonai has ordered: each man is to gather according to his appetite — each is to take an ‘omer [two quarts] per person for everyone in his tent.” 17 The people of Isra’el did this. Some gathered more, some less; 18 but when they put it in an ‘omer-measure, whoever had gathered much had no excess; and whoever had gathered little had no shortage; nevertheless each person had gathered according to his appetite. 19 Moshe told them, “No one is to leave any of it till morning.” 20 But they didn’t pay attention to Moshe, and some kept the leftovers until morning. It bred worms and rotted, which made Moshe angry at them. 21 So they gathered it morning after morning, each person according to his appetite; but as the sun grew hot, it melted. ‘Tomorrow is a holy Shabbat for Adonai. and it didn’t rot or have worms. today you won’t find it in the field. 27 However, on the seventh day, some of the people went out to gather and found none. “How long will you refuse to observe my mitzvot (commands) and teachings? 29 Look, Adonai has given you the Shabbat. This is why he is providing bread for two days on the sixth day. 30 (S: vi) So the people rested on the seventh day. 31 The people called the food man. It was like coriander seed, white; and it tasted like honey cakes. 8 ‏ד‎ 8 “Remember the day, Shabbat, to set it apart for God. 9 You have six days to labor and do all your work, 10 but the seventh day is a Shabbat for Adonai your God. On it, you are not to do any kind of work — not you, your son or your daughter, not your male or female slave, not your livestock, and not the foreigner staying with you inside the gates to your property. 11 For in six days, Adonai made heaven and earth, the sea and everything in them; but on the seventh day he rested. This is why Adonai blessed the day, Shabbat, and separated it for himself. so he rested on the seventh day from all his work which he had made. so that it itself could produce. blessed, holy (separated it as) and 7th day. Thoralf Gilbrant, ed., “1313,” in The Complete Biblical Library Hebrew-English Dictionary – Aleph-Beth, (Springfield, IL: World Library Press, Inc., 1998), WORDsearch CROSS e-book, Under: “1313”. The Lord blessed (baruch) the 7th day . . .
Thoralf Gilbrant, ed., “7227,” in The Complete Biblical Library Hebrew-English Dictionary – Pe-Resh, (Springfield, IL: World Library Press, Inc., 1998), WORDsearch CROSS e-book, Under: “7227”. This second word is Holy (Kadosh). the verb qādhash means “to be holy.” It is mostly used of things being set apart for temple use in worship of the Lord, such as the altar (cf. Exo. 29:37). . . The other forms of the verb (Piel, Hiphil, Hithpael) deal with making someone or something holy to God. This means making them qualified to be used in his presence for his purposes. It usually involves acts of ceremonial obedience by the priests or people and God’s sovereign declaration. God’s work in people’s lives is sovereign, but it does involve a response by them. Sometimes the translators choose to translate acts of dedication with “consecrate,” while in other situations it is “sanctify.” Both English words translate the same Hebrew word, indicating that making something or someone holy is all by the grace and power of God. In Exo. 29:44, the Lord says that in order to fulfill his purpose to have a people to live among He must sanctify the priests, the altar and the Tabernacle. The Lord of Hosts, The entire world is filled with His Glory . . .
“More holy than the holiest holiness is Adonai-Tzva’ot! God in three persons, blessed Trinity! . . . So what about 7th day ?
. . . Shevîʿî is used to describe the “seventh day” in Gen. 2:2 and elsewhere (ca. forty times). Thoralf Gilbrant, ed., “8113,” in The Complete Biblical Library Hebrew-English Dictionary – Sin-Taw, (Springfield, IL: World Library Press, Inc., 1998), WORDsearch CROSS e-book, Under: “8113”. Here is where things get a little tricky. There are many arguments regarding the Sabbath – some are sound and some are nuttier than a holiday fruit cake. I am not here debate theologies and traditions because ideology is a fragile thing and I don’t think tearing down others is productive or helpful. That being said, one might ask what my purpose in this word study is then?!? Simple – to promote study of God’s word in a historical and a grammatical context so that we can make informed decisions individually, concerning the text, instead of relying solely on traditions that are handed down through the generations, that may or may not be correct in part or in whole. This is a long study as I want to be thorough. Since we know what the command is now, let’s look at the word ‏שַׁבָּת‎shabbāth (Sabbath). I count 111 times in in the Older Covenants (Old Testament) where shabbath is used. So what does the word mean? shabbāth is found in the Dead Sea Scrolls, Jewish Aramaic, Syriac, Ethiopic, Tigre and Aramaic. . . The obligation to honor the Sabbath Day was established as holy unto the Lord, and a day during which the normal activities and labors of the other six days of the week were to be avoided. Work was to be planned so as to leave the seventh day free for worship. This last day of the week was to be devoted to worship and fellowship at the sanctuary of the Lord, with the prime attention being directed toward the glory and revealed will of the holy God. This was to be the day in which all of God’s children would gather for the reading of the Torah and the sharing of needs and insights on the part of those belonging to the fellowship of grace. Works of necessity or mercy were by no means excluded (cf. Matt. 21:1-31), but were rather to be understood as deeds of sympathy, love and compassion to peoples or livestock who stood in need of special help. 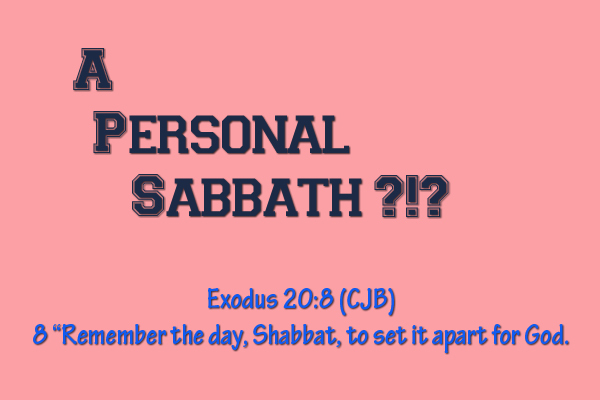 The importance of keeping the Sabbath as a precious and holy day is explained in Exo. 20:11. It was a grateful recognition that God had created the world in six creative days or stages (as set forth in Gen. 1) and then set apart the seventh day as a special reminder and celebration of his fashioning the entire universe in all of its grandeur. Every week, his covenant-keeping people were to honor Him by refraining from those normal activities and recreations performed on the first six days in order that they might devote their attention to study of the Word and prayer, assembling for the singing of hymns and for mutual admonition and encouragement in their own homes and family circles. That this was not left as a mere option for Israel was forcibly brought out by the penalty of death meted out to one of their number who deliberately had gone foraging for firewood on the Sabbath (Num. 15:32-36). . .
Thoralf Gilbrant, ed., “8141,” in The Complete Biblical Library Hebrew-English Dictionary – Sin-Taw, (Springfield, IL: World Library Press, Inc., 1998), WORDsearch CROSS e-book, Under: “8141”. 2323 ‏שָׁבַת‎(shābat) <H7673>cease, desist, rest. 2323c ‏שָׁבַת‎(shābat) keep the Sabbath (Leviticus 25:2; Leviticus 23:32). Denominative verb. 2323e ‏מִשְׁבָּת‎(mishbāt) <H4868>cessation, annihilation (Lament. 1:7). There is still some question as to whether the noun shabbāt is derived from the verb shābat, or whether shabbāt is primary, and the verb derived from it. In any case, it should be observed that the meaning of shābat is “to rest” in the sense of repose only when the verb is used in a Sabbath context (and this is confined to the Qal stem, thirteen of twenty-seven times). The basic thrust of the verb is, when transitive, “to sever, put an end to,” and when intransitive, “to desist, to come to an end.” This may possibly indicate that the Sabbath is the day which ‘puts a stop to’ the week’s work. R. Laird Harris, Gleason L. Archer, Bruce K. Waltke, ed., “2323: ‏שָׁבַת‎,” in Theological Wordbook of the Old Testament, (Chicago: Moody Press, 1980), WORDsearch CROSS e-book, 902-903. Why is this necessary to know? Because the Hebrew informs the Greek. The writers were Jews. Their understanding was Jewish. Messiah is an entirely Jewish concept. Without the Hebrew word Mashiach (Messiah), there can NOT be the Greek word Christos (Christ) concerning the concept of a prophesied Messiah. So as we can see, Shabbat (Sabbath) is Baruch (Blessed) and Kadosh (Holy), as in set apart, for Adonai (Lord). What does the Greek say? 56 times, Shabbat (Sabbath) is mentioned in the four Gospels alone. 10 more times in acts it is mentioned. Once in first Corinthians, once in Colossians and one in Hebrews for a total of 69 times. Sabbath, a period of 7 days. This noun is a Greek transliteration of the Hebrew term shabbāth, which was probably derived from the verb sāvath, “to cease.” “Sabbath” referred to the day when all work ceased (cf. Leviticus 23:32; 2 Chronicles 36:21). After God established a covenantal relationship with Israel, He instituted a sabbath-day observance among the Jews that was to serve as a memorial of the Exodus (Deuteronomy 5:15). Exodus 20 shows that the way Israel was to observe the Sabbath was analogous to God’s rest (cf. Genesis 2:3): no work on the seventh day of each week (verses 8-11). . . In the Old Testament the Hebrew term shabbāth is used most frequently to designate observance of the seventh day by ceasing from work and participating in cultic activity (Exodus 16:29; 20:8-11; 31:15; Leviticus 23:3). The “sabbath” also came to be used to designate certain feast days. . . The prophet Jeremiah exhorted the Israelites to “hallow the sabbath day” (Jeremiah 17:27). Ezekiel echoed this emphasis by saying that such observance would be a “sign” that the people know God (Ezekiel 20:12,20). From the Exodus to the period of the exile, the Sabbath was to be positively observed, remembered, and hallowed as a witness to God’s saving activity in both creation and in deliverance from captivity (ibid.). In the New Testament sabbaton is used only by the Gospel writers and Paul. All of the occurrences in the Gospels concern Jesus and His ministry. In one respect Jesus faithfully observed the Sabbath by attending activities in the synagogue and temple and on occasion by teaching there (Mark 1:21; 6:2; Luke 4:16,31). . . These conflicts over sabbath regulations did not involve any violation of the Mosaic law. Jesus never violated the Torah. . .
Paul, like Jesus, continued to observe the Sabbath . . .
Thoralf Gilbrant, ed., “4378. σάββατον,” in The Complete Biblical Library Greek-English Dictionary – Sigma-Omega, (Springfield, MO: Complete Biblical Library, 1991), WORDsearch CROSS e-book, Under: “4378. Ïƒá½±Î²Î²Î±Ï„Î¿Î½”. Not once in the text are we told that Sabbath is abrogated. Go ahead and check – I encourage you to! 16 Now if the hallah offered as firstfruits is holy, so is the whole loaf. And if the root is holy, so are the branches. and have become equal sharers in the rich root of the olive tree, 18 then don’t boast as if you were better than the branches! the root is supporting you. 19 So you will say, “Branches were broken off so that I might be grafted in.” 20 True, but so what? They were broken off because of their lack of trust. However, you keep your place only because of your trust. he certainly won’t spare you! provided you maintain yourself in that kindness! Otherwise, you too will be cut off! because God is able to graft them back in. be grafted back into their own olive tree! Thoralf Gilbrant, ed., “5986,” in The Complete Biblical Library Hebrew-English Dictionary – Nun-Ayin, (Springfield, IL: World Library Press, Inc., 1998), WORDsearch CROSS e-book, Under: “5986”. R. Laird Harris, Gleason L. Archer, Bruce K. Waltke, ed., “1631: ‏עלם‎,” in Theological Wordbook of the Old Testament, (Chicago: Moody Press, 1980), WORDsearch CROSS e-book, 672-673. 21 “‘But the children too rebelled against me. and they profaned my shabbats. Then I said I would pour out my fury on them and spend my anger on them in the desert. so that you will know that I am Adonai, who sets you apart for me. because it is set apart for you. or whoever does any work on it is to be cut off from his people. Whoever does any work on the day of Shabbat must be put to death. People like to throw away the death penalty. I am not even going to broach this subject one way or the other. There is a clear teaching here: Loyalty and obedience to Adonai. Let me ask you a very simple question to help you wrap your mind around this . . . What are the eternal consequences of willful disloyalty and disobedience? If repentance is turning to God from our sins, then wouldn’t apostasy be turning away from God to our sins? Do both roads lead to salvation? and he prolonged his message until midnight. in breaking bread and in the prayers. and many miracles and signs took place through the emissaries. and distributed the proceeds to all who were in need. they shared their food in joy and simplicity of heart, 47 praising God and having the respect of all the people. And day after day the Lord kept adding to them those who were being saved. They gathered together to break bread daily – not just the first day of the week or Shabbat. We can NOT make the assumption that culturally they worshiped and met as we do once a week because the text plainly says otherwise. Since the text tells us that Sha’ul (Paul) and Yeshua (Jesus) observed Shabbat as Jews, we also can NOT assume as a result of this passage that this all of a sudden changed, in perpetuity, 50 to 60 years after Yeshua’s death on the execution stake (cross) when Luke wrote this letter. To do so would be irresponsible and eisegetical at best. It is conceivable that those that believe God’s instruction (Torah: law) ended with Yeshua’s death believe the perpetual covenant ended with His death as well. However, that belief would make Sha’ul somewhat of a moron since he continued to observe Shabbat even after accepting Yeshua as Messiah, wouldn’t it? Let me explain. Yeshua added to the law of adultery in His 3 year ministry by adding the heart part. If the law ended at His death, then this was a 3 year (or less depending on how long His ministry had been going when he added to it) at best. I get a lot of blank stares when I ask this question. Sometimes I get a head scratch. Sometimes I even get a nervous laugh. 5 But these had gone on ahead and were waiting for us at Troas. and there we stayed seven days. This is a chronological trip. It is told as such. There is no theological paradigm shift here. Did they meet together to celebrate our Lord’s resurrection on the first day of the week (Sunday)? Undoubtedly! Did they meet together on the 7th day of the week Shabbat (Saturday)? Undoubtedly! Did they meet together on the other days too (Monday through Friday)? Undoubtedly because as we learned, they met together daily! They stayed for the “days” of unleavened bread, then for 5 days, then for 7 days . . . this is not hard to see unless you are looking at it through a theological pair of glasses. Christendom did change the Sabbath from Saturday to Sunday—but there is no scriptural mandate for this decision, as has often been demonstrated. . . There is limited evidence that some of Yeshua’s early followers celebrated his resurrection, which took place on a Sunday, in early morning gatherings for prayer or worship on that day. But we must not see that through the lens of later church practice, since there was not a five-day work week in that culture, and so Jewish believers who continued to observe the Sabbath did not set aside Sunday as an additional day of worship (or change their Saturday observance to Sunday). At most, they added another time of worship and prayer to their weekly schedule on Sunday mornings (or, possibly, evenings). But, to repeat: These Jewish followers of Yeshua did not change the Sabbath to Sunday. and it is not found anywhere in the New Testament. Michael L. Brown, Answering Jewish Objections to Jesus – Volume 4: New Testament Objections, (Grand Rapids, MI: Baker Books, 2007), WORDsearch CROSS e-book, 269-273. This leaves us with some questions to ponder – some study of the text to do. Does tradition trump God’s Word? So, back the the title of this post: A Personal Sabbath? If we look at if from the definition only as rest and cessation from work, then personal Sabbath has merit. If we look at it as a Baruch (Blessed) and Kadosh (Holy) day set apart by Adonai Eloheinu melekh ha-olam (LORD, our God, sovereign of the universe), then that merit is not so meritorious. This has never changed. It can be argued that the Lord’s day is Sunday. This still doesn’t change the commands about the Sabbath. 12 at that time had no Messiah. You were estranged from the national life of Isra’el. You were foreigners to the covenants embodying God’s promise. You were in this world without hope and without God. have been brought near through the shedding of the Messiah’s blood. with its commands set forth in the form of ordinances. and thus in himself killing that enmity. have access in one Spirit to the Father. 19 So then, you are no longer foreigners and strangers. and members of God’s family. with the cornerstone being Yeshua the Messiah himself. in union with the Lord. into a spiritual dwelling-place for God! if we discard Shabbat or try to pass Sunday off as Shabbat? I’ll let you decide . . . This entry was posted in Word Studies and tagged Adonai, christianity, Dr Michael Brown, even if, Jesus, Lord, Sabbath, shabbat, Yeshua. Bookmark the permalink. 2 Responses to A Personal Sabbath?!? Long as you said, but very good and well organized. It is good to share with those yet not observing the seventh day sabbath and to plant seeds. or put a pebble in some shoes . . . Blessings to you!